This year will be a James Bond year par excellence. It’s the 50th screen anniversary for Ian Felming’s agent ‘On Her Majesty’s Secret Service’. In 1962 ‘Dr No’ launched the most successful movie series ever and Bond fans are wishfully waiting for the release of ‘Skyfall’, the upcoming movie. But Bond still saves the world in literature, too. In Jeffery Deaver’s latest spy thriller ‘Carte Blance’ the secret agent meets the challenge of avoiding an assault. 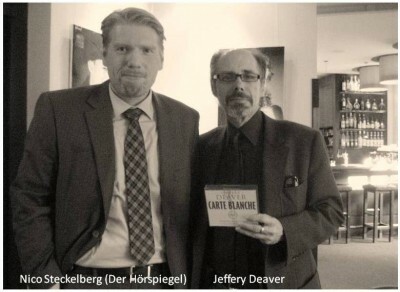 We met Jeffery Deaver for an interview in Cologne’s Luxury Hotel im Wasserturm in a truly Bondian atmosphere. To talk about the opportunities and risks of updating Fleming’s Bond, the author’s personally preferred candidates for a leading actor and title track artist in a potential ‘Cart Blanche’ movie adaptation as well as the fine art of creating a cocktail. Nico Steckelberg (Der Hörspiegel): So, here he is – The Man With The Golden Pen, or Typewriter... Good afternoon, Mr. Jeffery Deaver. Jeffery Deaver: (Laughing) Well, word processor. Well said, dankeschön! Nico Steckelberg (Der Hörspiegel): Thank you for being here today. You’re recently on a reading tour with Dietmar Wunder, the German voice of Daniel Craig. Please tell us about your first tour impressions. Jeffery Deaver: Well, it has not only been extremely productive – which is important to me: I want to meet as many readers as I can. But it’s also been a lot of fun. I only hate to admit that, because I’m enjoying myself far too much. We put together a good show, I think. And we’re truly enjoying spending time together. I think we put together a very comfortable and informative presentation for the readers. 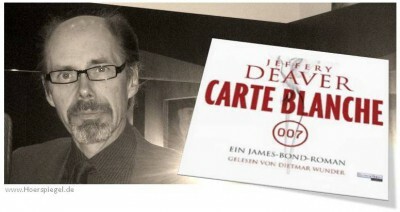 Nico Steckelberg (Der Hörspiegel): So, this is your first James Bond novel called “Carte Blanche”. How does it feel to you not only to only be a suspicion writer but being an official Bond author? Jeffery Deaver: It’s a great honor. When I was approached by the Estate about 2 ½ years ago and they asked if I would write the next Bond book I debated … five seconds. Surely, yes, I would do it! But I would say that there were some considerations, and they were quite simple. I wanted to make sure that the book was very immediate for my readers. I love Sebastian Faulks’s version. But that was set in the past. It was more of a historical piece. I didn’t want to do that. I wanted the book to be set in the present date with Bond as a young agent who had just recently joined the British Intelligence. So it had that immediacy, so that people could really relate better to Bond and the geopolitics of the era. I am honest, I have readers of all ages, and there are seventeen years olds who don’t know what the Soviet Union was and who don’t know that Germany was divided. Or who Stalin was. And writing a book about the Cold War would require a lot of explanation, and that would slow the story down. So I just wanted to make it young and updated. And one other thing: I needed to write just one of my books that had to have James Bond in it. And I worked very hard to make sure that Bond was an individual that the Bond fans around the world liked and was recognizable. But I would not write a character study like Ian Fleming did. I mean, those plots were very simple in Fleming’s books. I wanted to write a Deaver novel that moves very, very quickly, has lots of deadlines, lots of reversals and lots of twists in the end. And then the Estate said “Yes” and so that’s what we did. Nico Steckelberg (Der Hörspiegel): There is an “Authorized Biography” of Bond from the 1970s that declares Bond’s year of birth is 1920. So in the 1950s, when most of Flemings novels are set, he is between 30 and 40 years old. Charlie Higson, who wrote the Young Bond books, managed to put his characters into this biographical and historical context. Your James Bond lives today, as you already mentioned. On the other hand you refer to many details from the Fleming novels, e.g. when you describe Bond’s appearance – his black hair, the scar in his face. So, is “Carte Blanche” a mixture of the modern Bond movie look & feel with some links to the origin of the series? Jeffery Deaver: Yeah, well, I didn’t use any of the movies or the continuation novels, I went only back to the original material and to the extents that Fleming stated as fact about Bond. Such as he had a Scottish father and a Swiss mother. I kept that. Provided it could be substantiated in the present date. There is still a Royal Naval Reserve, the volunteer component of the Royal Navy. And there is the rank of Commander. His parents, as you know, died when he was eleven in the original books. But Fleming said nothing more about their deaths. Now – in my book – that was where I was able to create my own sub-plot. He drove a Bentley in the original books. Well, he drove an Aston Martin once, but that was when the Bentley wasn’t working. So that extent I kept existent, but updated it. But I also tried to capture the essence of Bond from the original books; who was a man that was rather ironic. He could get some really good zingers, as we say in America. That means a kind of a sniping comment. E.g. about someone who is called Percy Osborne-Smith, who is everyone’s nightmare of a bureaucrat. We’ve all dealt with people like that, in government and in business. And Bond knows he has power over Bond, but he still gets some good comments occasionally. So I tried to keep Bond as he was in the original series, but updated. Nico Steckelberg (Der Hörspiegel): I personally think the story itself would have also worked in a 100% vintage Bond setting. Jeffery Deaver: Yeah, for except they didn’t know about recycling back then (Editor’s note: “Carte Blanche” deals with several recycling techniques). Nico Steckelberg (Der Hörspiegel): Sure, and also the other gadgets like the IQ phone with a lot of spy apps on it, for example. So these technical things were part of your motivation to make modern readers feel comfortable with the novel? Jeffery Deaver: Yes. There are conventions with Bond you have to have in a Bond book. Bond is a complicated character, but there are certain, apparently very simple elements that you need to incorporate. One is the travel. Bond has to travel to exotic locations. One needs the cars, an appreciation of liquor and wine and women. All of which appears. There are certainly many fewer gadgets in this book than in the movies. Fleming used very few gadgets in the original books, as I’m sure you are familiar. But you need some. And I actually know people in the Central Intelligence Agency. I toured the headquarters in Langley, Virginia. They have a museum of spy gadgets. Spies use gadgets. Pilots use gadgets. Surgeons use gadgets. We want them to, because that’s part of their skill. But I didn’t draw attention to it. Nico Steckelberg (Der Hörspiegel): What is the most important difference between writing a Lincoln Rhyme novel and a James Bond novel? Jeffery Deaver: Very little difference. The structure of the books is the same. I spent eight months outlining the book and doing the research. I don’t start to write a word until the outline is completely done. It does change a little bit when I write, but very little of what I write in the outline doesn’t make it into the final book. Both of the heroes – Bond and Lincoln Rhyme – use their minds as much as physical power. Well, Lincoln Rhyme of course can’t, but he has Amelia. What I think are the scenes that are the most compelling are not where Bond is talented with the machine gun or a knife. It’s where I fool the readers and Bond fools the villains by outthinking, such as mistaken identities. And when it looks like he has no chance to succeed he sets something up cleverly. So that the reader wouldn’t see that Bond is setting something up when they didn’t know that he was setting something up. I think the only difference really is that Lincoln Rhyme I created myself and James Bond existed. So I have a very great body of worked ground including the biography you mentioned, Kingsley Amis’s books plus the big bibles of Bond. So I had that information plus my own reading of the books from the time I was a young boy. There really isn’t a lot of difference. Nico Steckelberg (Der Hörspiegel): 2012 is James Bond’s 50th screen anniversary. And it has become one of the biggest trademarks and franchises ever. Jeffery Deaver: I think, the biggest sequel in the history of cinema. Nico Steckelberg (Der Hörspiegel): That means of course that there are Bond maniacs all over the world, and it was to be expected that a lot of fans have their own opinions on how James Bond has to be like. How much did that fact influence your writing – James Bond being sort of a pop idol? Jeffery Deaver: Now, I was very respectful to the Bond fans. I’m respectful to all my readers. I write for the readers. I have very little patience for authors who say, “I don’t care about the readers. I write for myself. I am the artist and it’s their job to like me.” But it’s ridiculous. It’s my job to understand what they like and then give it to them. What manufacturing company in the world would say, “It’s my job to create a car that I like.” That’d be ridiculous. I give you an example: I drive two German cars, a BMW and a Porsche. And I bought a series of BMWs, and every year there are improvements based on feedbacks or in understanding of the drivers’ needs. Why should an author be any different? I just listen very carefully to what readers want. And I knew that the Bond fans who are – shall we say rather vocal and rather opinionated – would want certain things in the book. So I intentionally did not refer to the movies at all in research. Because those Bonds are all over the map. They’re so different. George Lazenby – who I think was a little underrated, I think he is a very good actor – so different from Connery, different from Timothy Dalton etc etc. And they are all very different to David Niven - if you remember that one. Woody Allen writing a James Bond novel, I just can’t quite get over that. (Laughing) But I ignored the movies. Only the original material, and I think that that was much safer of what James Bond fans could possibly object. Of course the fans, they’re going to object something, to the fact that I would return to Ian Felming. If they don’t like the fact that he’s wearing the Rolex watch again instead of the Omegas from the movies I can simply say I went back to the original material. Some of the comments I got, they were a bit of concerned about that when Bond is in South Africa and he needs to rent a car, he gets a Subaru. But you’re not gonna rent an Aston Martin, be honest with you. When you drive an Aston Martin in South Africa – I don’t know the statistics, but car theft is one of the major crimes there. You’re simply not going to do that! But the fans were upset that he’s driving a Subaru. Well, they didn’t notice that it’s a WRX, which is a rallye car that could compete against an Aston Martin. It could beat an Aston Martin on a rallye course, but there was nothing I could do about that. Nico Steckelberg (Der Hörspiegel): So you do check out the reviews and the fan comments to find out how a novel works? Jeffery Deaver: Yes, I always look at feedbacks. Very important to me. I am much more sensitive to what fans say than what critics say. John Updike, who was a novelist, a bit of a poet, but mostly he was a literary critic who worked for the New Yorker Magazine. Now, Updike, who reviewed popular culture as well as literature, architecture, arts – he would not write a review of anything unless he had really studied that artist’s prior work and the other, competing artists who worked in that specific genre. And only when he was comfortable doing that would he write a review. And he never said, “This is good, this is bad.” He said, “This is to me not quite the standards of the artist’s earlier work. But it’s quite superior to xyz author.” Those reviews I like a lot, because it’s helpful to me. It’s helpful to readers, because it puts the work in perspective. I shouldn’t say a lot, but many reviewers write to hear the sound of their own voice. And they wanna come up with a clever phrase. Or just stay independent, whether it helps the readers or not. But you can tell pretty in a review, whether that’s true or not. But to be honest, I was reviewed a lot, and I was really embarrassed to say this. I remember one was a bad review, written by a young journalist for – I can’t remember what paper, but a big paper in England – it made no sense to me. He picked up but a few of my phrases, but he didn’t talk about the substance of the book. That didn’t bother me at all. He could have been motivated by the fact that an American wrote a Bond book. Or he was just having a bad day or he wanted to come up with some clever phrases, I don’t know. And one other review – which was otherwise quite positive –, a review in England, said, “The book’s very good. It works on all levels. However I wonder how long they can keep going with the Bond franchise in literature. People want to see the movies, that’s fine, but do we need another Bond novel?” Well, he said this one works, but there was this literal question he raised. Well, I think we can always have a Bond book. It’s not like there are x number of trees. You know, if we have a Bond book, therefore we are not going to be able to publish the next Cormac McCarthy novel, because we used up all the trees. But generously the reviews were really almost embarrassingly good. Saying I had outwritten Ian Fleming in some cases, which I had very mixed feelings about. I honestly felt really bad about that, but on the other hand, who is not going to be accelerated by that? So, this is important, it is the fans that I listen to the most. And I got very, very good comments, but mostly questions like I said before. Why is wearing a Canali suit and not a different one? You know, brand names and things like that. But they were thinking back to the movies. Nico Steckelberg (Der Hörspiegel): It is easy to feel like in a movie while reading “Carte Blanche”. When I was listening to the audio book I always had those cinematic pictures in my mind. Nico Steckelberg (Der Hörspiegel): I was wondering if you had these pictures in mind, too? While you were writing. Jeffery Deaver: Yeah, very much. When I write, I don’t really have any memory for words. It’s very difficult for me to memorize passages. However, I can look at and memorize and re-create a visual image quite easily. So, first of all I structure my books as movies. Because I think a good, solid movie is –so to say – a great cultural experience. It takes place over a short period of time, so it hast to be economical. You can’t waste any time on cinema. Two hours is very long for a film. That’s kind of standard now, but Alfred Hitchcock never made a film that is over 92 minutes, I think. Things are a little different now. So in that sense, I write with shifting points of views, like camera shifts. And that was made up to a big crescendo and then another surprise, so that is quite cinematic. And when I write, I close my eyes. I can touch-type when I close my eyes. And then I can see the scenes in my head. And I do hear a dialogue. I can create dialogue that is pretty realistic, but I can’t memorize it. Because I‘d have trouble trying to recreate the same conversation you and I just have. You can’t recreate something you said. Jeffery Deaver: As much as I respect here I would not probably pick Lady Gaga. I tell you who I would like. Do you know the album with Robert Plant and Alison Krauss? Alison Krauss is an absolute cross-over country/western singer in America. And I would love her to sing it. Actually I have just written an album of songs for my next book. Maybe I should write the lyrics for “Carte Blache”. You know, that could actually be a lot of fun. Now, I think that you have said that, I think I will probably try that. Nico Steckelberg (Der Hörspiegel): I’d love to hear that! Well, let’s get back to the movies. Is “Carte Blanche” to be seen as your personal candidature for joining the James Bond screenwriters? Jeffery Deaver: Well, I myself would not write the script. I have no interest in doing that. It’s a talent I don’t have. It takes a huge amount of time. It is also a creative product by committees. And a movie is the director’s medium. It’s not the writer’s medium. You must have a good script, but that’s the launching pad for the film. And with my novels I have 100% control, or at least 95% control. I would not want to give up – which I would have to do – give up the amount of time in writing my books that it would take to work on the script. I love movies very much, but would not want to do that. Nico Steckelberg (Der Hörspiegel): Were there any expectations from EON Productions (Editor’s note: The production company of the James Bond movies)? Jeffery Deaver: No, not EON Productions. The Ian Fleming Estate cared. They had complete approval rights. This was understood going in, but I had them approve what was for me a very short outline, probably a week after I re-decided to go forward with it. It was like 20 pages, but it was pretty much the whole art of the book that became “Carte Blanche”. And they approved it, made some good suggestions. And then I sat down and wrote the book. They didn’t look over my shoulder at all. And that was the way I asked for. They didn’t want to see a chapter and then another chapter. I couldn’t have done that, cause I don’t write that way. With the outline I prefer to write the last scene first, then the middle, so that wouldn’t have made any sense. But they were fine with that. And then I submitted the manuscript, and they could have said, “Oh, we don’t like it.” That would have been awkward, but that’s the way it was. And as it turned out they made relatively few changes. I was very pleased about that. And I was happy to make them. A few of them I said, “I don’t think we wanna do this for this reason or that reason.” And they were very understanding about that, we worked very well together. And out came the book. Nico Steckelberg (Der Hörspiegel): So what are your next book projects? And will there be a return of Jeffery Deaver’s James Bond? Jeffery Deaver: No, I wanted to do one, because I had to get back to my own characters. Right now I’m finishing a book that’s called “xo”, which is the way many people finish their e-mails. Like an emoticon, like a smiley face or something. And this means hugs and kisses. It’s usually said between a man and a woman, or two women also in this day and age… but it’s a term of fashion. And the book, very simply, is about a young attractive country/western singer-songwriter who sends out mass e-mails to her fans. She has tens of thousands of fans and one of them goes to a young man who sees her e-mail personal, “She says ‘xo’ – she loves me!” And he starts to fantasize about it. And then he becomes a very dangerous stalker. And that’s the book I wrote the country/western songs for. That will be released on iTunes, as downloads and CDs to support it. I’m writing my Lincoln Rhyme book right at the moment. I’m doing my third collection of my own short stories, I think none of them is published in Germany yet. And then I’m writing a stand-alone book at the same time. Well, I enjoyed writing “Carte Blanche” very much. The Estate is great to work with. And I might very well do it again, but in a few years. Nico Steckelberg (Der Hörspiegel): Well, the next one’s not meant that serious. How many hangovers did you have for professional reasons until you finally found the definite mixture for the “Carte Blanche” cocktail as mentioned in the novel? Jeffery Deaver: (Laughs) I have a specific answer to that: Seven! Because making a cocktail is not just the taste of the liquor, it’s the after-effect of the liquor. I also know my ingredients pretty well. But because I was crafting something completely new, I spent two days, and I made basically seven types of mixtures with different proportions. I wanted an orange flavored liquor mixed in with the whisky. And I tried Curaçao. Well, it’s blue, and together with the natural tan color of whisky, which is kind of like red, it becomes like brown. It looked awful, terrible! It was disgusting. So I had to try something else. Nico Steckelberg (Der Hörspiegel): Well, it seems to me that you have been a Bond fan yourself before you got the opportunity to write the book. Jeffery Deaver: Oh, yeah. A long, long time. Jeffery Deaver: I’ll probably buy some overpriced pop corn and go see it with my girlfriend. I look forward to it. I enjoy the Daniel Craig franchises. I like “Casino Royale” very much. “Quantum of Solace” had Daniel Craig in it, and he’s a great actor. I like him very much. If “Carte Blanche” is made into a film, I would like him to play it. Although I think there is an Australian Artist who is quite interesting. Guy Pearce. He to me looks very much to me Hoagy Carmichael, the original physical model for Bond. Well, I would like to see him, but if Daniel Craig would like to do it, good! I would like to play the villain, I must admit! Nico Steckelberg (Der Hörspiegel): Who does not? Jeffery Deaver: (Laughs) Yeah, we always want to be the bad guys!